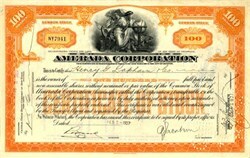 Beautifully engraved certificate from the Amerada Corporation issued in 1927. 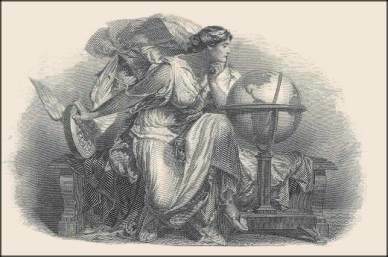 This historic document was printed by the American Banknote Company and has an ornate border around it with a vignette of an allegorical woman with a globe. This item is hand signed by the Company’s Vice President and Secretary and is over 88 years old. In 1919 British oil entrepreneur Lord Cowdray formed Amerada Corporation to explore for oil in North America. Cowdray soon hired geophysicist Everette DeGolyer, a pioneer in oil geology research. DeGolyer's systematic methods helped Amerada not only find oil deposits faster but also pick up fields missed by competitors. DeGolyer became president of Amerada in 1929 but left in 1932 to work independently. After WWII Amerada began exploring overseas and during the 1950s entered pipelining and refining. It continued its overseas exploration through Oasis, a consortium formed in 1964 with Marathon, Shell, and Continental to explore in Libya. Leon Hess began to buy stock in Amerada in 1966. The son of immigrants, he had entered the oil business during the Depression, selling "resid" -- thick refining leftovers that refineries discarded -- from a 1929 Dodge truck in New Jersey. He bought the resid cheap and sold it as heating fuel to hotels. Hess also speculated, buying oil at low prices in the summer and selling it for a profit in the winter. He later bought more trucks, a transportation network, refineries, and gas stations and went into oil exploration. Expansion pushed up debt, so in 1962 Leon's company went public as Hess Oil and Chemical after merging with Cletrac Corporation. Hess acquired Amerada in 1969, after an ownership battle with Phillips Petroleum. During the 1970s Arab oil embargo, Amerada Hess began drilling on Alaska's North Slope.Oilman T. Boone Pickens bought up a chunk of Amerada Hess stock during the 1980s, spurring takeover rumors. They proved premature. Amerada Hess completed a pipeline in 1993 to carry natural gas from the North Sea to the UK. In 1995 Leon Hess stepped down as CEO (he died in 1999), and his son John took the position. Amerada Hess sold its 81% interest in the Northstar oil field in Alaska to BP, and the next year Petro-Canada bought the company's Canadian operations. In 1996 the company acquired a 25% stake in UK-based Premier Oil. The company teamed with Dixons Stores Group in 1997 to market gas in the UK. It also purchased 66 Pick Wick convenience store/service stations. In 1998 Amerada Hess signed production-sharing contracts with a Malaysian oil firm as part of its strategy to move into Southeast Asia and began to sell natural gas to retail customers in the UK. To offset losses brought on by depressed oil prices, Amerada Hess sold assets worth more than $300 million in 1999, including its southeastern pipeline network, gas stations in Georgia and South Carolina, and Gulf Coast terminals. It also moved into Latin America, acquiring stakes in fields in offshore Brazil. In 2000 Amerada Hess acquired Statoil Energy Services, which markets natural gas and electricity to industrial and commercial customers in the northeastern US. It also announced its intention to buy LASMO, a UK-based exploration and production company, before Italy's Eni topped the Amerada Hess offer. In 2001 the company agreed to buy Dallas-based exploration and production company Triton Energy for $2.7 billion in cash and $500 million in assumed debt. Amerada Hess also agreed to acquire the Gulf of Mexico assets of LLOG Exploration Company for $750 million. Amerada Hess Corporation explores for, produces, purchases, transports and sells crude oil and natural gas. These exploration and production activities take place in the United States, United Kingdom, Norway, Denmark, Gabon, Algeria, Azerbaijan, Indonesia, Thailand, Malaysia, Brazil and other countries. The Company also manufactures, purchases, transports, trades and markets refined petroleum and other energy products. The Company owns 50% of a refinery joint venture in the United States Virgin Islands, and another refining facility, terminals and retail outlets located on the East Coast of the United States.